As someone who’s been a food blogger for quite some time and reading food blogs for even longer, there are certain bloggers who just speak to my food-loving soul. I’m sure you have some too–where every recipe they publish makes you say to yourself, “Yep, I would eat that!” Cotter Crunch is one of those blogs for me and when I heard Lindsay was working on a cookbook? I was pretty darn excited about it. Basically, if you are all about that bowl life, you need this book. 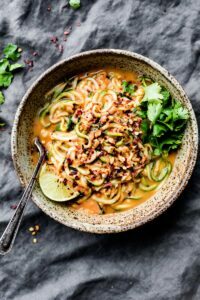 These Curried Satay Veggie Bowls take the familiar flavors of a Thai curry and transform them into something completely different. Stir fried zucchini noodles are served in a creamy sauce made with pureed chickpeas, red curry spaces, coconut milk, peanut butter, and spices. Garnish with fresh cilantro, crushed peanuts, and a lime wedge and you’ve got a 15 minute dinner that’s way better than takeout. To make the satay sauce, combine the chickpeas, red curry paste, garlic, ginger, oil, mustard and 2 tablespoons (30 ml) coconut milk in a food processor or blender. Blend until mixed. With the food processor on low, slowly add the peanut butter, vinegar, salt and pepper. Blend again until creamy. For thinner sauce, add 1 tablespoon (15 ml) or more of coconut milk. Stop and scrape sides once or twice if needed. Put the sauce in a bowl and set aside. Extra sauce can be stored in the fridge for up to 5 days. In a large skillet or wok, add the oil and stir-fry the zucchini noodles with the tamari for 2 to 3 minutes, or until zucchini noodles are soft, but not mushy. Remove and place zucchini noodles in one large serving bowl or 2 smaller serving bowls. Once you add the sauce, serve immediately. Due to the high water content in the zucchini noodles, the sauce will become soupy if left to sit. Simply add more zucchini noodles to thicken the sauce, or spoon out a few tablespoons of liquid. But not to worry: even the thinned out sauce is delicious with the noodles. Totally slurp worthy! To make zucchini noodles without a spiralizer, simply julienne slice them or use a potato peeler to create long flat shavings or ribbons.